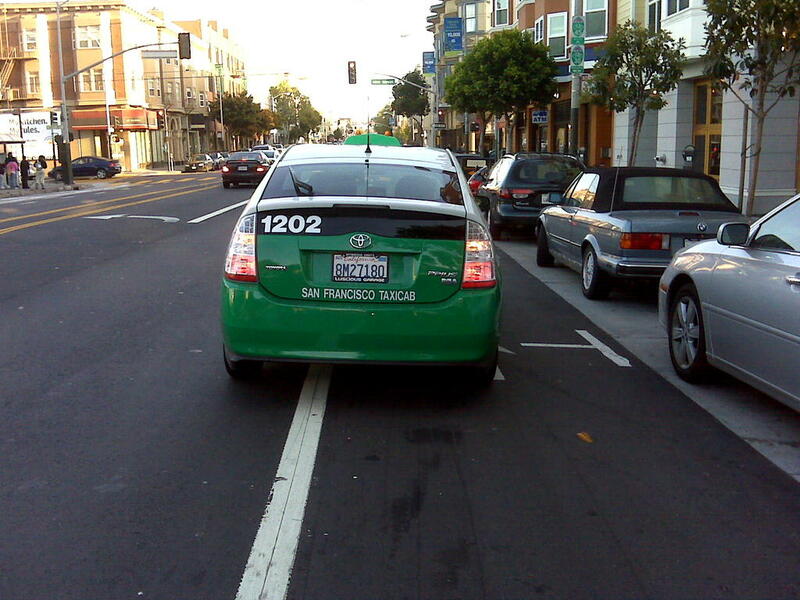 The San Francisco Municipal Transportation Agency (SFMTA) is officially allowing taxi drivers to block bicycle lanes. A memo [PDF] from Deputy Director of Taxi Services Christiane Hayashi and Accessible Services Manager Annette Williams says the agency is issuing bumper stickers to taxi drivers telling Parking Control Officers not to cite them. The memo, signed by Deputy Director of Taxis Services Christiane Hayashi, says not only will the SFMTA issue the bumper stickers, but it has also issued “guidance” to the Parking Control Officers instructing them not to ticket taxi drivers who are actively loading or unloading in bike lanes. Taxis stopped in bike lanes routinely endanger people on bikes in San Francisco, and legitimizing the practice could encourage more of it. When blocked, bicycle riders are typically forced into passing motor traffic or between parked cars, where drivers or taxi passengers may open doors in their path. Condoning such a dangerous practice seems incongruous with the SFMTA’s goals of improving the safety of bicycling in the city. “The proliferation of new bicycle lanes throughout San Francisco has caused some confusion for taxi drivers and led, in some cases, to citations being issued while loading and unloading passengers in these bike lanes,” the memo states. However, the decision seems to have been made without an opportunity for public input. Cheryl Brinkman, a member of the SFMTA Board of Directors, said she’d heard discussion about the needs of disabled passengers, but not of the wider policy change. Rose, the SFMTA’s spokesperson, offered no comment on the public process. The SFMTA will also issue decals “cautioning passengers to took for people on bicycles when exiting the vehicle to be affixed in the lower right hand corner of the rear window,” according to the memo. Alternative measures to help accommodate the needs of both bicyclists and disabled passengers could include converting more car parking into taxi stands. New York, a city comparable to San Francisco, prohibits [PDF, pg. 52] motor vehicles from stopping in bike lanes at all. Bike lanes can also be raised up near the level of the curb, allowing passengers to access the curb without conflicting with bicycle traffic. This practice can be seen in successful cycling cities like Copenhagen, Denmark, and similar features will be included in the coming redesign of San Francisco’s Masonic Avenue. Francisco, and legitimizing the practice could encourage more of it. • I’ve been seeing more and more of these stickers.Guidelines for PCOs have long been in violation of California Vehicle Code, and in the case of cars parked on the sidewalk, the Federal ADA.